When I was 30 my 10 year plan was to build a new career focussed on delivering value from IT Infrastructure, earn £45K a year (in todays terms) and be there for my wife and kids. I exceeded all of these but in doing so contributed to significant health problems. When I got to 40 my plan was to rebuild my health, support Debbie in her new career, find a sustainable and enjoyable low stress job working a lot less hours, spend more time with Debbie and kids and save for retirement. I’ve mostly achieved all of these goals, so now at 50 I’m planning for the next 10 years! In general I’m not in favour of planning too much in the short term, but it does pay to have some idea of where I’m going in broad terms. Of course any good plan, needs to have contingencies. My health is currently getting slightly worse, not better. I might get made redundant or the stock market might falter. So I’m building resilience into this plan, so that it adapts to unforeseen changes. The plan of action in slightly more detail follows. As we find we have more time on our hands, Debbie and I need to make sure we spend some of that time together, to make sure we don’t run the risk of spending it growing apart. We’ve started this already, eating out more and getting into the routine of going out together at weekends. I’m loving it, but we can do more. This is especially important as Debbie gets more absorbed by her teaching diploma and later career. The kids will probably leave home some time in the next 10 years, I want them to spread their wings and so we probably won’t live close to them. It’s important to me to find some shared interests and rituals that allow us to keep in touch, beyond the obligatory visits. I want to really enjoy the next 10 years, I want to practice retirement ideas when I can, like taking plenty of holidays, evenings out, weekend and week long adventures and lots of learning. I also want to keep my life simple though, not buying things but maxing out on the simple experiences in life that bring joy every day. I need to find a way to eat organ meats, onions and eliminate most sugar from my diet except maybe a weekly treat. keeping working is a constant challenge. How do I make myself useful in the limited hours I work. I’ve done ok on this so far, this blog provides a record of how. As to saving enough money, this is now largely down to the stock market, but several other factors will contribute. I’m already sketching out ideas for my first book in a Simple Guide To Health on my blog. Once this is finished in a few months, I’m planning to revisit each article and research it much more thoroughly, expand the article, add links to additional resources and add diagrams/info-graphics. It will take me about 2 years to revisit all the articles. These articles will provide the raw content for the book which will then need a lot of additional crafting. I’m hoping to have it ready in 2-3 years time, probably for free as an eBook, or maybe 99p. I’m then hoping to write at least two more books. The first is An Architects Guide to Project Management, I already have a rough sketch for this book in the series of articles summarised in Why Projects Fail and What To Do About It. These articles will need expanding and then need to go through the same process of iteration described above. Much as I love St Anne’s it seems foolish to not consider other options. Moving would probably be exciting, but it’s also a risk. I’m slightly conflicted, on one hand I believe in being content with what I have, that happiness comes from within and that we can get plenty of excitement by travelling. On the other hand when I go to other places that I love like Cleveleys, Scarborough or Filey and soak up the views and breath in the fresh sea air I yearn for a change. This would allow us to turn the conservatory, currently my office, into a sunny dining room for two and a dedicated sun lounge. No computers in sight! Of course we would need these rooms to convert back into sleeping space for visitors too. If my health falters I can spend more time enjoying interests that are more house/garden/workshop centric rather than travel, cycling and walking. 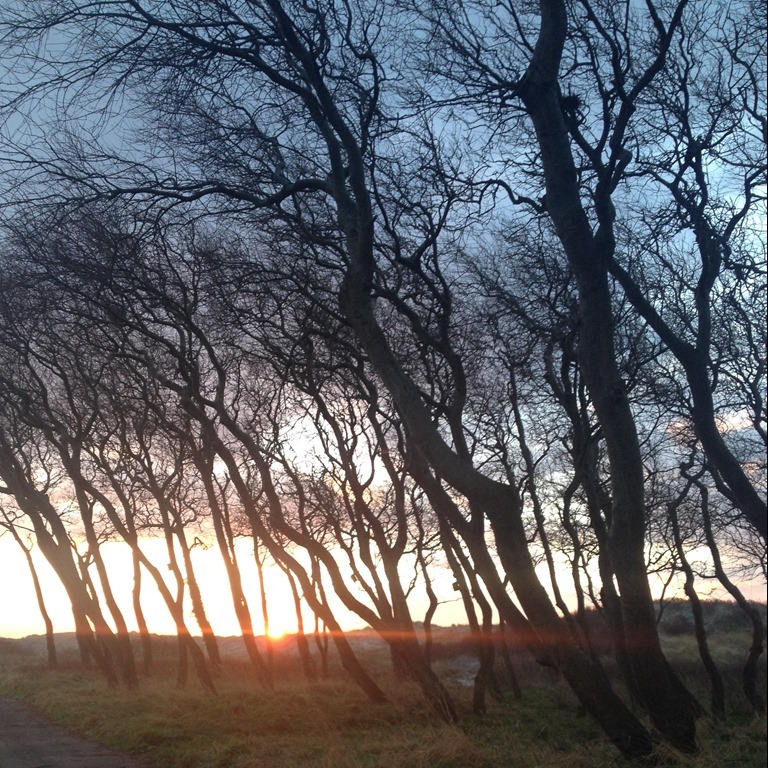 The photo at the top of the page is of the sun rising through the trees, close to the beach near our house. I took it on my 50th birthday, a great photo for a post about my 10 year plan for a new dawn.